This Creamy Greek Summer Salad makes for a delectably simple side dish, filled with fresh ingredients, that is great for summer parties! This refreshing, light, and yummy salad can be eaten as a side, used as a dip for crunchy pita chips or placed in a wrap (maybe with baked falafel?). It is super easy to make, even if you don’t have a spiralizer, and aside from soaking the cashews it takes hardly any time at all! Place the cucumber, red onion, tomato, radish and artichoke hearts into a large bowl and toss them together. In a blender, puree the cashews, water, lemon juice, garlic, and dill until completely smooth. Pour the creamy mixture over the veggies, and season with salt and pepper to taste. Refrigerate for 20 minutes or until chilled, serve. With fresh ingredients like this, I just had to call it a creamy greek summer salad. The crisp cucumbers, peppery radishes, and fresh lemon juice bring this dish to life and will make the transition from spring to summer much easier. oh my gosh that looks so delicious! tahini and potato salad — sign me up! i bet it would be GREAT as a wrap! sounds like lunch to me! thanks for the recipe! Wow, such a creative way to make creamy dressing! Will be making a variation of this for sure! Making a cream with cashews can be an awesome base for so many sauces, creams, etc. I highly recommend it! Yum! I love how many ways you could have this! Wow…this looks so yummy! I can’t wait to give it a try and I love the idea of serving it in a pita! Thanks! I have to make this! It looks really, really delicious and refreshing. Plus, you had me at falafel. wow i am drooling. i love cashew cream! so going to make this! and what kind of mandolin is that? 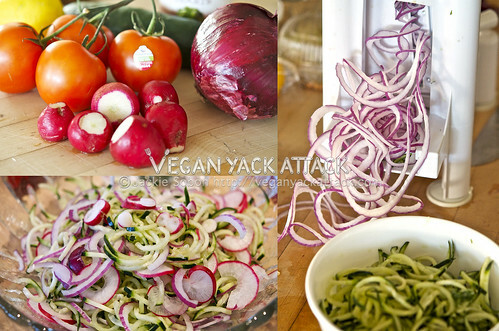 a spiralizer? i’ve never seen yours before!